The Trump Administration’s proposed fuel economy standard rollback and revocation of California’s ability to set vehicle emissions standards will harm consumers and the environment. This research note finds the proposal would cost the U.S. economy up to $457 billion through 2050, while increasing U.S. emissions up to 11% and gasoline use 20% through 2035. Canada’s government has proposed the ambitious Pan-Canadian Framework (PCF) policies to help achieve its emissions reduction goals. The Canada Energy Policy Simulator was created to evaluate the PCF, and this report finds that even if the PCF is fully implemented, Canada’s 2030 emissions will miss its goal by 161 million metric tons (MMT), a gap 3.7 times larger than the government’s 44 MMT predicted shortfall. Extending and strengthening PCF policies would allow Canada to come much closer to its target, save money, and save human lives. The U.S. Chamber of Commerce’s proposal to raise the federal fuel user fee (gas tax) $0.25 per gallon has driven debate over U.S. transportation funding. This research note finds the proposal would generate $840 billion in federal government revenue by 2050 and cost U.S. drivers $30 billion per year by 2022. It would also increase annual EV sales by 100,000 per year and add 1.2 million total additional EVs to U.S. roads while reducing annual fuel consumption 40-45 million barrels and cutting total fuel use more than 1.3 billion barrels, both by 2050, and would equal a national carbon tax of $29 per ton. 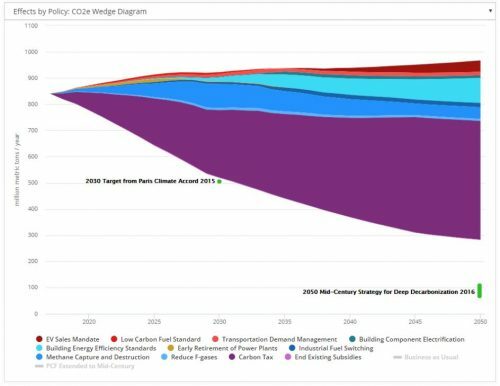 New modeling using the Energy Policy Simulator forecasts electric vehicle sales will make up 65% of new light-duty vehicle sales by 2050, and could reach up to 75% by 2050 in the event of high oil prices or strong technology cost declines. The modeling includes expected market share expansion and penetration levels, the effects of internal factors like battery prices, external factors like oil prices and government policy support, and related national electricity demand. A court decision to vacate EPA’s rule to reduce hydrofluorocarbons (HFCs) could cost at least 3.6 billion metric tons avoided emissions through 2050 and limits U.S. options to fully implement the Kigali Amendment to the Montreal Protocol, which could cut cumulative U.S. emissions by 9.5 billion metric tons. This research note report analyzes potential impacts of the court decision, as well as alternatives for the U.S. to fully implement the Kigali Amendment. In October 2015, Energy Innovation launched Energy Policy Solutions, an assessment of climate and energy policies to help meet decarbonization goals. We created a computer model, the Energy Policy Simulator, to quantitatively measure the cost and emissions impacts of more than 50 policies across all economic sectors. This page summarizes key findings from our model analysis, including recommended policy packages for meeting the U.S. 2025 emissions target and the Clean Power Plan target. It pays to adopt smart energy policy sooner rather than later. If policymakers wait just four years (until 2020) to take action and want to achieve the same emissions reductions by 2030, they risk nearly $400 billion in additional costs. Policy implementation should start early to take advantage of natural capital stock turnover and the increased productivity of an efficient system. Energy Innovation identified a cost-effective package of six policies that the U.S. could use to meet the Clean Power Plan at a national average scale. This scenario actually exceeds the emissions goals in later years, as policies designed to meet earlier targets continue to reap benefits in later years, and saves the U.S. more than $40 billion between 2016 and 2030. Discover the most effective policies to decarbonize America’s economy at the lowest cost. The Energy Policy Simulator was designed to empower decision makers to find the best course toward a low-carbon U.S. economy. The Energy Policy Simulator works in real-time to measure the cost and emissions impacts of more than 50 climate and energy policies.